When you’re in the market for a new or new-to-you Toyota, visit Toyota of Hollywood FL. 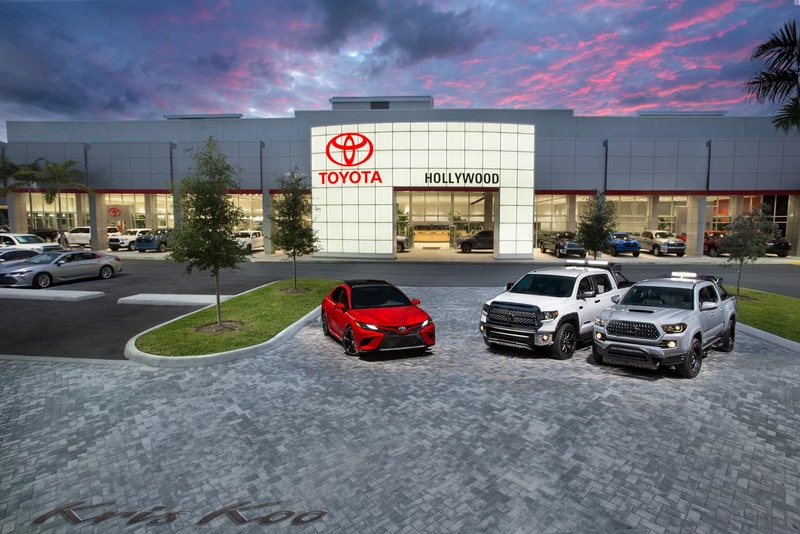 Our Toyota dealership in Hollywood, FL, offers flexible hours and an expert staff that can take care of your every need. We’ve been in business since 1981, and our impressive inventory is filled with hundreds of new and used Toyota models. For the past five years in a row we’ve been No. 1 in volume for Toyota sales in the Southeast Region of the United Sates*, so you can be assured we have something you’ll love.Upgrade your daily drives with a new Toyota from our Toyota dealership near Pembroke Pines, FL. Enjoy the comforts of a new sedan like the Toyota Camry or Toyota Corolla, or leave plenty of room for cargo and passengers with the new Toyota RAV4. We also have hundreds of used Toyota models, like the Toyota Avalon and Toyota Prius. If you’re interested in buying or leasing a Certified Pre-Owned Toyota, our Toyota financing team can help you there, too. We’ll look at your entire financial background to find a financing rate that is affordable to you. We’re fully committed to your satisfaction, which is why we’re currently constructing a brand-new, state-of-the-art Toyota service center. We appreciate your patience during this time, and we look forward to opening this new service center for everyone to enjoy. You can still visit us for oil and filter changes, tire rotations, brake inspections and other kinds of repairs, and don’t forget to inquire about our complimentary rental vehicles. If you’d like to order OEM Toyota parts and pick them up at our dealership, you can do that, too! You can expect a lot from the 2012 Toyota RAV4. Under the hood you'll find a 4 cylinder engine with more than 170 horsepower, providing a spirited, yet composed ride and drive. Toyota infused the interior with top shelf amenities, such as: a rear window wiper, a tachometer, front bucket seats, power door mirrors, power windows, cruise control, and much more. Audio features include a CD player with MP3 capability, steering wheel mounted audio controls, and 6 well positioned speakers. Toyota also prioritized safety and security by including: head curtain airbags, front SIDE impact airbags, traction control, brake assist, anti-whiplash front head restraints, ignition disabling, and 4 wheel disc brakes with ABS. For added security, dynamic Stability Control supplements the drivetrain. A Carfax history report provides you peace of mind by detailing information related to past owners and service records. Our sales reps are knowledgeable and professional. We'd be happy to answer any questions that you may have. Please don't hesitate to give us a call. Come test drive this 2016 Toyota Corolla. With less than 30,000 miles on the odometer, this 4 door sedan prioritizes comfort, safety and convenience. It features a front-wheel-drive platform, an automatic transmission, and a 1.8 liter 4 cylinder engine. Top features include front bucket seats, delay-off headlights, 1-touch window functionality, a trip computer, an outside temperature display, power door mirrors, power windows, and more. Premium sound drives 6 speakers, providing you and your passengers a sensational audio experience. Toyota ensures the safety and security of its passengers with equipment such as: dual front impact airbags with occupant sensing airbag, head curtain airbags, traction control, brake assist, ignition disabling, and ABS brakes. Various mechanical systems are monitored by electronic stability control, keeping you on your intended path. 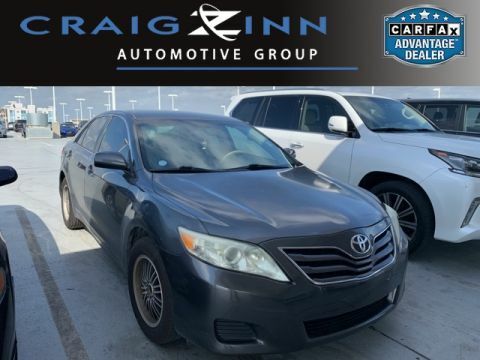 This vehicle has achieved Certified Pre-Owned status, by passing Toyota's comprehensive certification process. We'd also be happy to help you arrange financing for your vehicle. Please don't hesitate to give us a call. Get excited about the 2013 Toyota Camry. This 4 door, 5 passenger sedan provides exceptional value! It features a front-wheel-drive platform, an automatic transmission, and a 2.5 liter 4 cylinder engine. Comfort and convenience were prioritized within, evidenced by amenities such as: a tachometer, front bucket seats, air conditioning, power door mirrors, power windows, an overhead console, and more. Audio features include a CD player with MP3 capability, steering wheel mounted audio controls, and 6 well positioned speakers. Toyota ensures the safety and security of its passengers with equipment such as: dual front impact airbags, front and rear SIDE impact airbags, traction control, ignition disabling, and 4 wheel disc brakes with ABS. Brake assist technology provides extra pressure when applying the brakes. It also arrives with a Carfax history report, providing you peace of mind with detailed information. We have the vehicle you've been searching for at a price you can afford. Stop by our dealership or give us a call for more information.